We offer a great range of traditional skirting boards with the high level of intricate detail you would expect to find in a period-style property. We manufacture replicas of designs widely used throughout specific periods in the past (Georgian, Edwardian, Victorian etc. 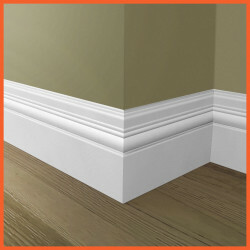 ), as well as others that take inspiration from these traditional skirting board styles. If you are renovating a period property and looking to match an existing skirting board this is a great place to start. If you can find what you are looking for, we do offer a bespoke service whereby we will recreate any profile exactly. If this is something of interest to you be sure to contact our sales team for a quote. In old-style interiors the skirting boards are generally much larger in terms of both overall height and thickness. This is mainly down to the ceiling height in older properties being greater than in modern homes. However, if you are creating a period style interior in a modern home we can create the look you want at whatever height you feel is appropriate. Traditionally skirting boards and other interior mouldings are finished in a white gloss. We offer a finishing service that will allow you to order your skirting boards fully finished so that they are ready to install upon delivery.